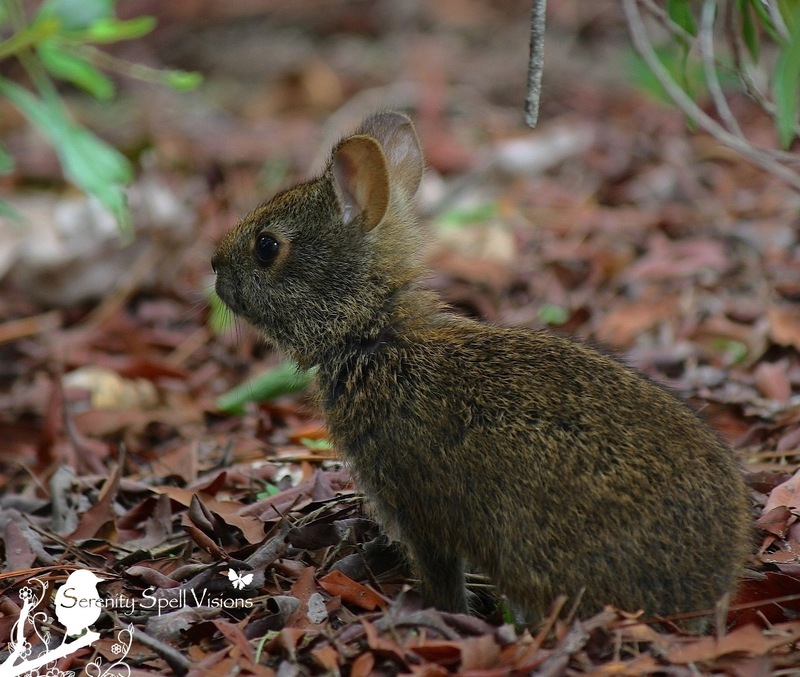 In honor of the upcoming Easter holiday, an Everglades bunny for you! True to its name, the marsh rabbit is found in the marshes and swamps of the Eastern and Southern United States. Our marsh rabbits — not to be confused with the larger swamp rabbits of Alabama through Texas — are delicate little things. Those on the Florida peninsula, and in South Florida in particular, weigh only 2-3 pounds, reaching a total length of 17 inches. “Mainland” (non-Florida) marsh rabbits run noticeably larger. 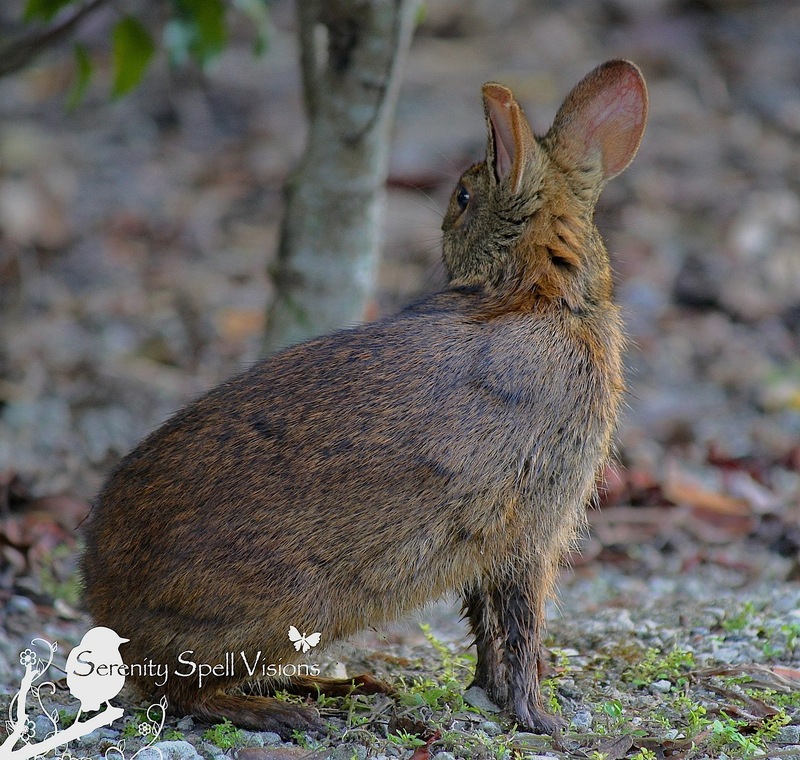 Florida’s marsh rabbits have shorter ears, and smaller legs than the swamp rabbits and cottontails — and instead of a bushy, cottonball-tail, the tail forms a tuft. They’re also darker in coloration than eastern cottontails. What’s so interesting about our marsh rabbits, as their name signifies, is their proclivity to water — swimming often and well, sometimes for long distances. It’s common to see them in the shallow waters of our wetlands scrounging for food (note the wet legs of the guy above). Another interesting feature of marsh rabbits is that they walk on all fours, like a cat — ensuring easy and swift negotiation of the dense marshes and the surrounding vegetation. Their preferred habitats are the brackish and freshwater marshes, mangrove swamps, and sandy islands. 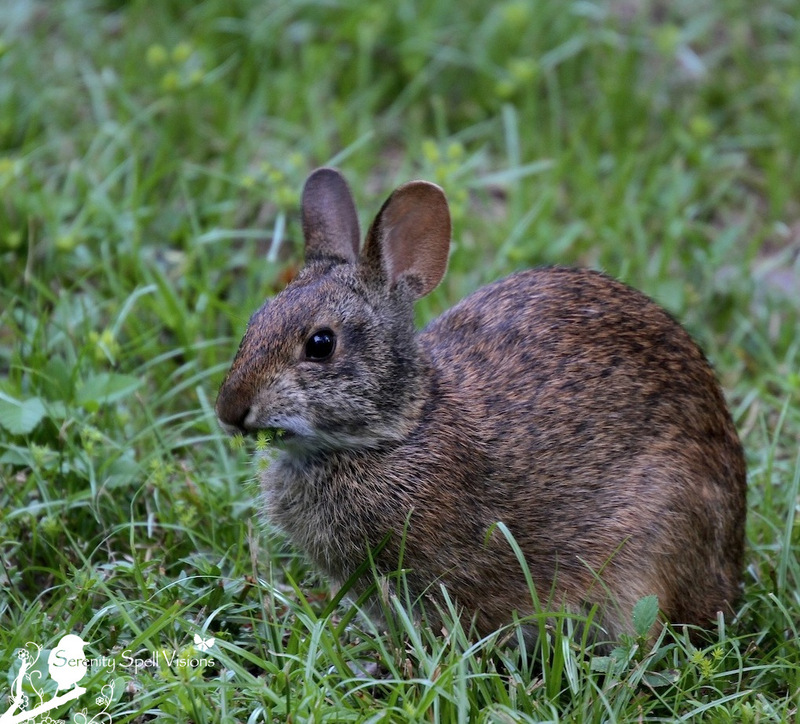 These rabbits must have access to water, remaining on high ground and in the thick vegetation for protection from predators including alligators, snakes, bobcats, foxes, coyotes, and birds of prey. They’re most active at dusk and at night, eating the abundant wetland and aquatic plants. There honestly couldn’t be anything more adorable than a Marsh rabbit baby. Just try. They’re truly adorable little things…. And the baby marsh rabbits? Cuteness factor through the roof. I like to call them *all* swamp bunnies though, much to the chagrin of uptight naturalists who may be listening in on my insanity. But it’s hard not to envision fae around these critters, helping us occasionally close-minded humans love and appreciate their, and Nature’s beauty, all the more. How interesting that they swim and yes, that baby is cuteness deluxe – adorable! That baby is just too much, honestly!! Aw, the burr… Love the little creatures and happy they have place to thrive. Your post is a beautiful wake up company for me. They are lagomorphs? Ella Wheeler Wilcox brings me to the end of my reply with tears in my eyes. I see that there will always be those of us who care deeply. Hee, I had to look it up… But that’s indeed their Order! Aren’t they the sweetest, most unusual little guys? I just love that quote of hers… Every time I see it, it hits right to my heart and soul. Thank you for sharing it, too. I feel it, as you do. Glorious! I’ve always found it interesting that there are so many unique subspecies in Florida (Florida panther, Key deer, etc.) It makes it that much more important to protect them, since they occur nowhere else on the planet. But, like everywhere else, habitat is the key to protecting a species. We need more land set aside for conservation. You’re exactly right, on all points — this area is home to such a unique collection of sub-species; MANY of which are threatened or of special concern. And protecting the land which is SO critical to their survival has proven to be a real challenge for this state. I hope it’s getting better, but developers still have much power. How cute. Once again you have enlightened me. I have never heard of this bun. They are so much cuter than cottontails, hard to believe, but they are! I wouldn’t have guessed the water angle. It’s still a hoot to see them in the waters; I always watch for gators when I see them. Soooo cute! Gotta love the always adorable Mr. Bunny! We used to have rabbits all over the place, but this Spring none. However…we have been seeing more coyotes. Coincidence? I don’t think so. Aren’t they the sweetest guys? Interesting — I haven’t been seeing as many rabbits in my area, too! Hmmm…. Thanks so much! I can never get enough of these little ones. Always the sweetest little things! Happy Easter to you — thank you!! Hoppity Hop! Happy Easter to you, your family and woodland friends. They’re the sweetest little things, aren’t they? I just love seeing them in our wetlands and swamps… And the babies. Sigh!! There is no such thing as an un-cute bunny, and your marsh rabbits are no exception. I had no idea there were bunnies who love water! Fascinating. It IS funny seeing these guys (still) in the waters. I always look out for the gators when I see them, sweet little things. Christina, I had no idea this cute Marsh Rabbit bunny even existed. Thanks so much for introducing it to me!! Thanks so much for this wonderful post! I had no idea there were marsh rabbit – I don’t suppose they feed on marsh mallows, now do they? 😉 Happy Easter! Man… I’m so horrible at jokes. See, that would have been PERFECT! Still smiling. Yes, that little one is as cute as it gets! I enjoyed seeing these because I had never seen a marsh rabbit. This winter we have had a cottontail living under our log deck though. Ah, a companion cottontail! Did you feed him/her? When I was in Scotland I saw “beach bunnies” — probably regular bunnies who just happened to be on the beach. Anyway they were munching away at seaweed on the beach which struck this landlocked Ohioan as odd. They really do negotiate the swamps and wetlands like a cat…. I watch them often. There’s no possible way they could *hop* around that muck! Ah, interesting!! Well, these guys are often in beach-y environments too. I wonder if what you saw is a similar sub-species as our Marsh rabbit!! I need to get one in motion in the swamps to show you… I haven’t SEEN many this year, though! Very odd. 😦 But I’ll make a concerted effort to get one creeping for you, like a kitty. Sorry I’ve not been around here much, haven’t been well. Hope to do better later. Ah, I hope you return to health soon enough! Sending good vibes your way…. These guys are such an interesting species — there are many fascinating sub-species down here, and this is a perfect example. Hmmmm … no cotton tail and short ears…. hoppy Easter to you. Heh, but they’re still the most adorable little critters! 🙂 Hope you’re having a hoppy Easter too, thank you!! So very sweet! 🙂 Hoppy, happy Easter! They’re SO incredibly sweet. 🙂 Hope you’re having a hoppy happy Easter, too — THANK you!! Such cute bunnies ! I want one !!! I love your images and the watermark! I love your handle… At first, upon waking up, I read it as “my kid shave 4 legs.” Caffeine obviously hadn’t hit!